alaTest has collected and analyzed 13 reviews of Hisense 65N5300. The average rating for this product is 4.6/5, compared to an average rating of 4.6/5 for other products in the same category for all reviews. Reviewers are impressed by the glare and sound. The usability and image quality are also mentioned favorably, whereas opinions are divided on the price. We analyzed user and expert ratings, product age and more factors. 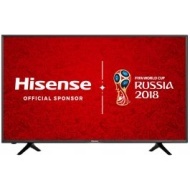 Compared to other products in the same category the Hisense 65N5300 is awarded an overall alaScore™ of 89/100 = Very good quality. Bought this tv and it is excellent!!! Bought another 2 tvs. I bought this TV for gaming for a small Children's charity. It has been used by dozens of children every day that can't wait to experience the quality and size of the Tv. Had the TV for about a month and I couldn't be happier. It's a great picture, easy to use and install. Great overall experience and expert staff. Great staff who really helped me and knew what they were talking about.